Anri Sala (b. 1974) is an Albanian-born artist who uses video and sound to create complex works of art that emanate from the painful history of his home country and its Communist past. His work demonstrates careful attention to detail and a sophistication of thought and subtlety. Sala studied painting at the Albanian National Academy of Arts from 1992 to 1996 and later studied video in Paris, France at the École Nationale Supérieure des Arts Décoratifs from 1996 to 1998. His pivotal work, Intervista—Finding the Words (1998), was made when he was still a film student in Paris. To produce this work he found 25-year old video footage featuring his own mother at a Communist rally in Albania. The found footage had no audio so neither he nor his mother had any idea what was being said. He then was able to get a deaf person skilled at lip reading to watch the video and recreate the transcript. Using the transcript he could tell his mother what she said. Her reaction to her own words was one of shock and disbelief. Anri said of his mother’s words, “if you hear it 25 years later you are surprised and saddened by the stiffness of the language.” The work confronts Albania’s painful history in a powerful way. At the Marian Goodman Gallery Sala had two works on display, both of which are being presented for the first time in this country. 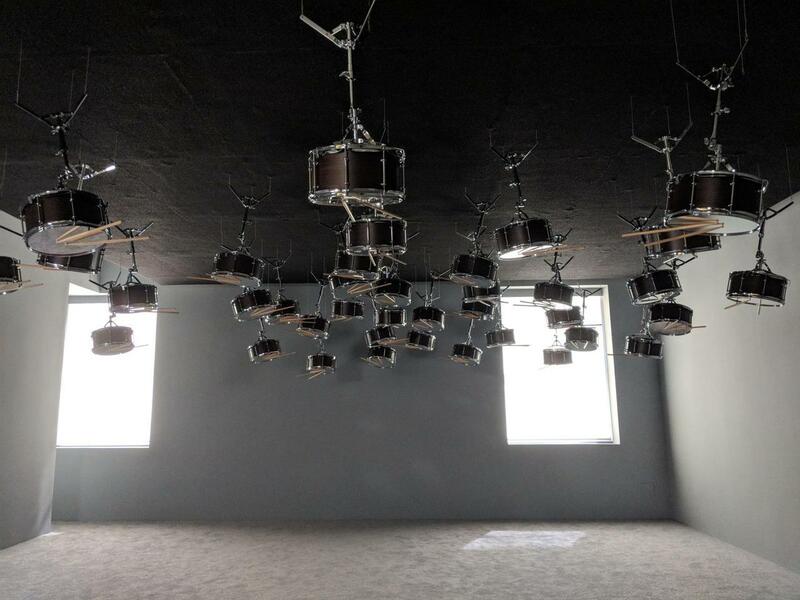 In the main gallery is The Last Resort (2017), a sound installation featuring 38 snare drums suspended from the ceiling. Speakers on the wall played the Adagio of Mozart’s Clarinet concerto in A major, chosen because it was an important musical creation during the European enlightenment, a time when nations were “rethinking the constructs of politics and science.” Speakers inside the drums caused drumsticks attached to the drums to move back and forth, playing the instrument. The other work on display is the film If and Only If (2018). This piece shows the journey of a snail moving across a viola bow as the violist Gérard Caussé performs Igor Stravinsky’s Elegy for Solo Viola. The presence and weight of the snail on the bow subtly disrupts the performance and Caussé’s ability to perform the piece. Caussé then needs to adapt to push the snail to continue moving along the bow. Anri Sala’s works are well thought out pieces that employ carefully constructed video and sound. He builds on his Albanian cultural background to produce works that originate with the pain and struggles of his country’s Communist past. Marian Goodman Gallery. “Anri Sala.” Marian Goodman Gallery. 2. Mar. 2018. Print. 25 Mar. 2018. Kaldor Public Art Projects. “Anri Sala: The Last Resort (1/4).” Online video clip. YouTube, 9 Oct. 2017. Web. 25 Mar. 2018. Bloomberg TV Markets and Finance. “Anri Sala's Aural Experiences | Brilliant Ideas Ep. 72.” Online video clip. YouTube, 5 Feb. 2018. Web. 25 Mar. 2018.